A Different type of Bouquet of Flowers! Thank goodness for the school holidays, it means for me, so much more stuff gets done. So on Wednesday, my mummabear and I spent about half an hour looking around at flowers, for my Auntie who had lost her husband. I spent most of the trip, walking around, listening to Mummabear talking about flowers, don’t want to buy flowers, flowers die, she will mostly likely have loads of flowers. I thought Auntie needed something different, something that could really cheer her up, and what’s tons better than flowers, you guessed it CAKE!!! Cake makes everything better ! The next problem, was how could I make cakes, and something special to ease her loss and make her smile again. Then I remembered something I saw on Pinterest. How beautiful is this for a gift! So Mummabear, and I started rushing around the shops to find the bits and bobs to make this. Let’s just say trying to find a Styrofoam ball, isn’t easy especially in one small local shopping centre. But we did and then next problem was a pot to balance the ball on, but that was the easiest part. The next part is the fun bit, actually doing the flower part of this wonderful bouquet. 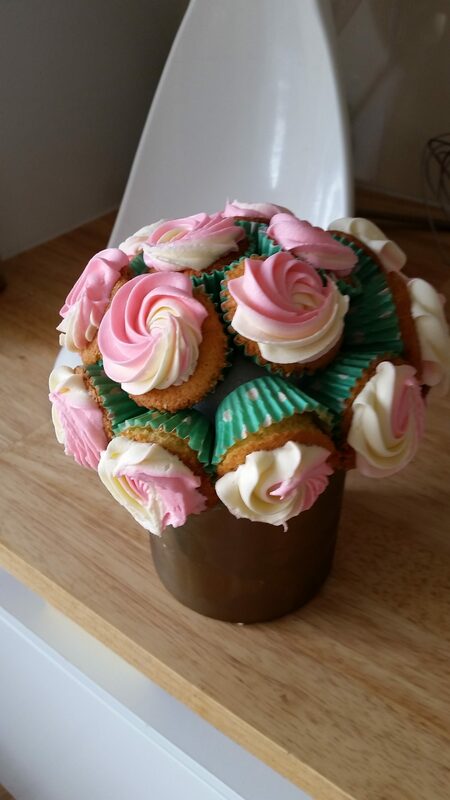 The flowers a made of mini VANILLA CUPCAKES, topped with yummy sweet buttercream. Once we actually got back for the shops, I had about an hour to do the whole thing, before mummabear was going to need it. So off to work I went,and let’s just say I needed the whole hour. 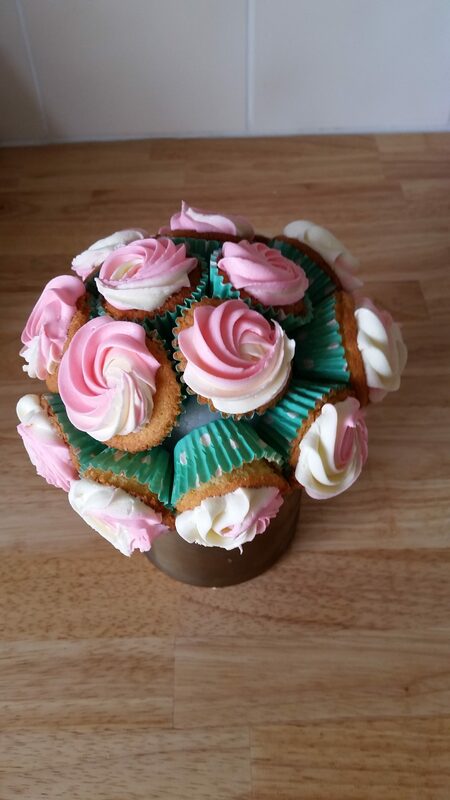 The cupcakes, are made with my basic vanilla cupcake recipe, along with my favourite vanilla buttercream, which is piped with no 7 pastry tube. To get the dual colour, I simply placed plain white buttercream on one side, then pink on other. Really simple and makes these look outstanding!!! The piping of the cupcakes, was the quickest part of the whole thing surprisingly. The hardest part was definitely trying to assemble and attach all the flower cupcakes. 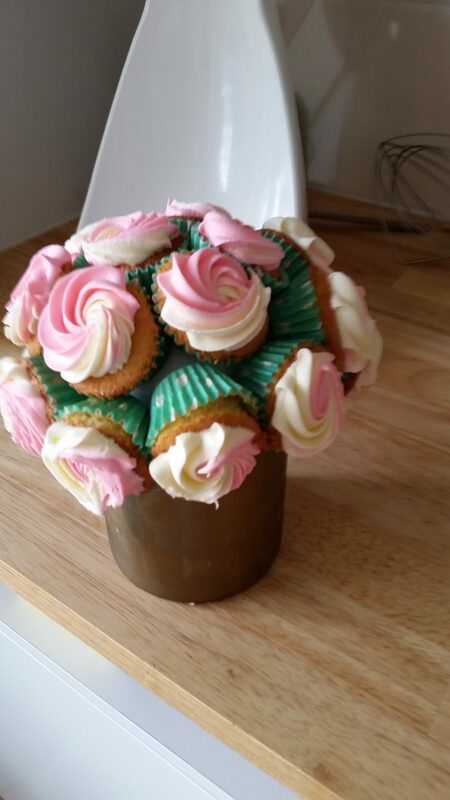 I used about 3 toothpicks per mini cupcake flower to hold them on the ball. Omg how beautiful and looks delicious too! I’d love one of these as a gifts. So talented. 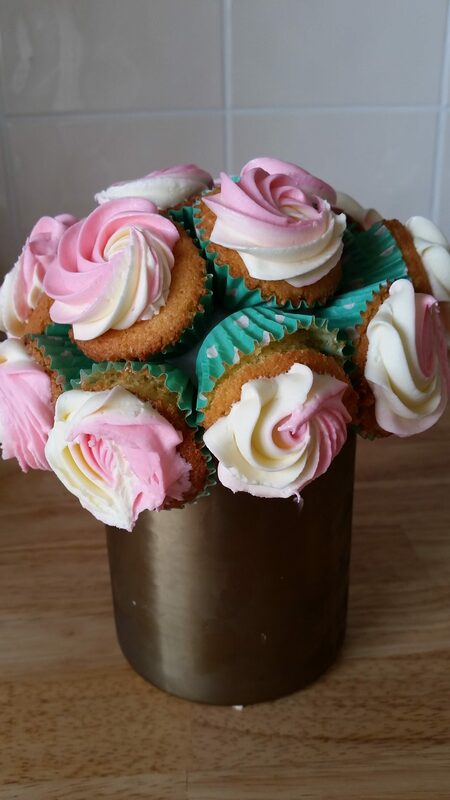 I love seeing the different versions of cupcake bouquets. Yours are adorable! Yeah, Thank you. The little cupcakes do make it extra cute! Oh wow, I LOVE these! So pretty. And delicious too, I imagine. They were definitely well enjoyed at a time in need. This is beautiful and it looks simple to make. I would like to try this. Thank you so much, maybe one day I’ll post video tutorial about it! Your bouquet turned out amazing. I’m sure your Auntie appreciated all of your hard work. Thank you! Well it was all eaten, so I guess that shows it! Possibly one day I will. I can be clumsy too,but slow and steady works for me! These are adorable! How do you keep the frosting from falling off of the ones that are nearly upside-down? Pure magic, I honestly didn’t think it would stay either. I think it’s to do with consistency of the buttercream. I love this! Now, you’re having me craving sweets! Sorry not Sorry! Thank you! What a lovely way to cheer someone up. I’m sorry for your aunt’s loss. I am really liking this idea, it’s also the perfect gift for Mother’s day! I’m sure it’s going to be a huge hit with the women in our lives. Such a beautiful work of art. I’m sure your Aunt really appreciated the kind gesture. I think it’s really sweet that you decided to make something this pretty for your aunt. I hope she feels better soon, it’s never easy to lose a loved one. This is so cute! I would love to give something like this to someone to be able to enjoy. Omg how cute is this?!?! I just love cupcakes!!! So need to make!!! I love it! I wish mine looked as good as yours do!